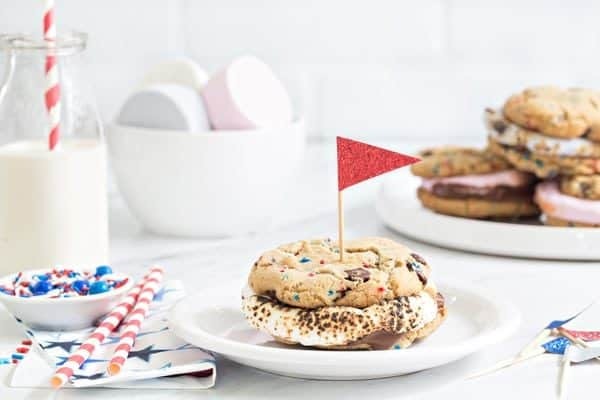 Chocolate Chip Cookie S’mores are loaded with dark chocolate chips and festive sprinkles and then topped with roasted marshmallows and more chocolate. They’re a fun twist on a campfire classic. This post is sponsored by Campfire® Marshmallows. Thank you for continuing to support the brands that make My Baking Addiction possible. I seriously cannot believe that today is the last day of June. I honestly have no idea where the days have gone, but they’ve certainly flown by. I’m telling you guys, it’s going to be Christmas before we know it. If you’ve been following along here for quite some time, you may remember that we moved into our new house about 2 years ago. And while we’ve done quite a bit to make this place a home, we really didn’t do much to the backyard except plant grass. Now that Elle is a bit older, we wanted to focus our attention and budget on the backyard to make it a safe and fun place for her to play. We started by purchasing a really great playset. I’ll be honest, it was a beast to put together, but it was worth every single dollar and second because Elle has already spent countless hours swinging, sliding, and whipping up plastic chicken drumsticks and corn cobs on the little stovetop. We’re now in the beginning stages of having our paver patio installed and we couldn’t be more excited. 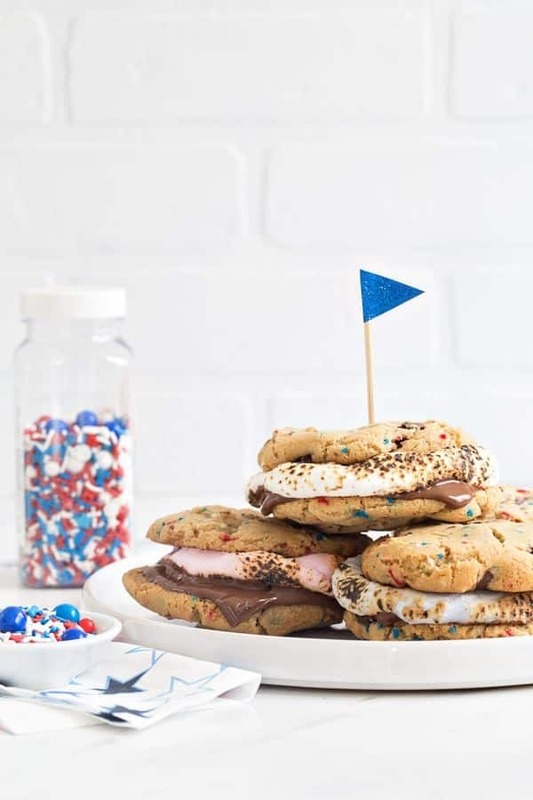 Even though it won’t be finished by the Fourth of July, we’re still having a little get-together here complete with burgers, hot dogs and of course – s’mores. While I’m a huge fan of traditional s’mores, I decided to kick my s’mores game up a notch for the holiday. I started with my favorite chocolate chip cookie dough and added in festive red, white and blue sprinkles. Since this cookie dough calls for a 24-hour chill time, you’ll definitely want to whip it up a day or two in advance. If you simply can’t wait 24 hours, be sure to at least give the dough a good 3 hours in the fridge. 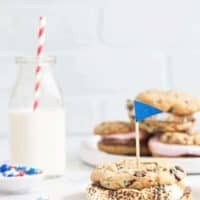 I baked those up to perfection then sandwiched two cookies with melty chocolate and gooey Campfire® Marshmallows to create these Chocolate Chip Cookie S’mores. 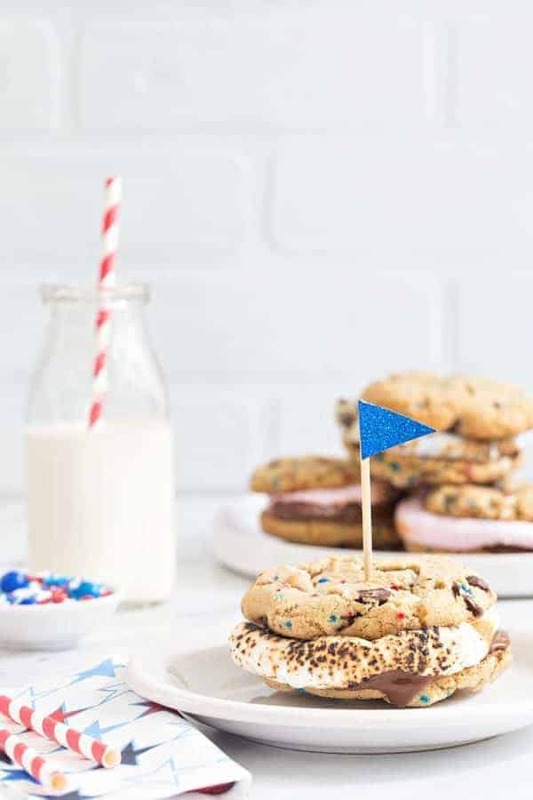 But since we’re celebrating the Fourth of July, I didn’t use plain white marshmallows for these Chocolate Chip Cookie S’mores. Nope, we’re going big here and using Campfire Red, White and Blue Roasters. 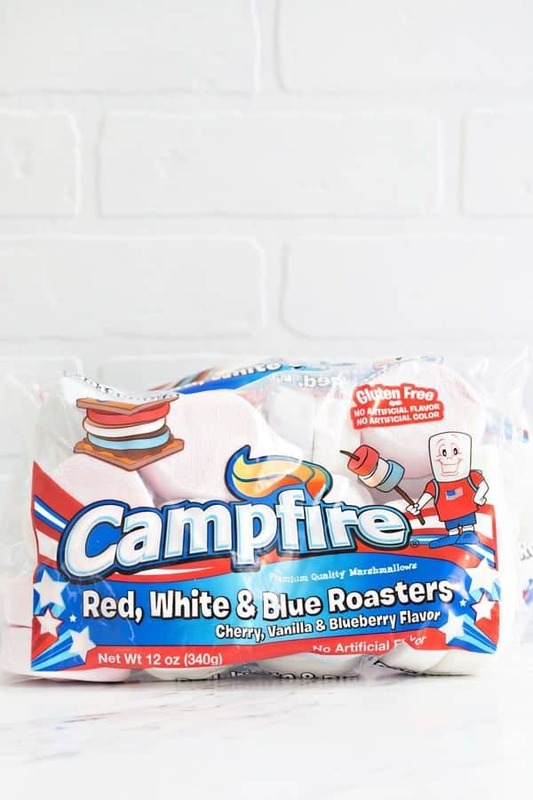 It doesn’t get much more festive than these deliciously sweet cherry, vanilla, and blueberry flavored marshmallows. I love the size and shape of these Campfire® Roasters because they are perfect for ooey-gooey s’mores! Is there anything better in summertime than a sunset and a gooey s’mores in your hand? I really don’t think so. And I’m super excited that our summers from now on are going to include both on our new patio, with Elle playing to her heart’s content nearby. What do you have going on this 4th of July? Big barbecuing plans? I’d love to hear about them! Looking for more s’mores inspired treats? Be sure to check out these Peanut Butter Cup S’mores Brownies and these S’mores Cupcakes! Both are sure to satisfy any s’mores craving! Using a stand mixer fitted with the paddle attachment, cream butter and sugars together until very light, about 5 minutes. Reduce speed to low, add dry ingredients and mix until just combined, 5 to 10 seconds. Add in chocolate chips and sprinkles and mix until incorporated. When ready to bake, preheat oven to 350°F . Line a baking sheet with parchment paper or a nonstick baking mat. Set aside. Use a large cookie scoop to scoop dough onto the prepared baking sheet. Bake until golden brown but still soft, 14 to 18 minutes. Allow cookies to cool on a wire rack. Repeat with remaining dough, or reserve dough, refrigerated, for baking remaining batches the next day. To assemble the Chocolate Chip Cookie S'mores, roast a Campfire® Red, White and Blue Roasters and sandwich it between cookies with a piece of chocolate. I hope you enjoy it, Rahul! These are too cute, and I LOVE the s’mores filling!